​Whatever we do or feel, our breath responds to it. I'd love for you to start imagining you have a built-in voice whispering b r e a t h e and you automatically gift yourself with little love notes through out the day! (timers work) you will feel these love notes tickle you and lift you up. Pausing and breathing are my pick-me-ups. The love I give to myself. I won't do without it! It's a simple practice. But practice it is. No, it won't work just nodding your head and move on. It's the Tiny Islands I love so much and we all can hop on anytime and anywhere. Three deep and joyful breath! Let the exhale be a little longer. Easy. No struggle. Just notice how this feels. No need to analyze or change it. The breath will deepen with time. It feels like joy! And your body wants more - all that's needed is You! You must want this. Don't worry if you think your breath isn't deep enough etc...let judgement go. Honor yourself for showing up! As you integrate this practice into your life you will learn to receive the breath as it is right for you. I'll inspire you!!! Promise! PS: I just got back from SoulTreat in Sedona. Hosted by The Wellness Universe by two amazing women you don't want to miss. Anna Pereira and Shari Alyse created a highly gifted and soulful community, offering resources for well-being on all levels. I have not found anything like it before. Use me as a reference if you like to join. I'd love to be connected with you there! 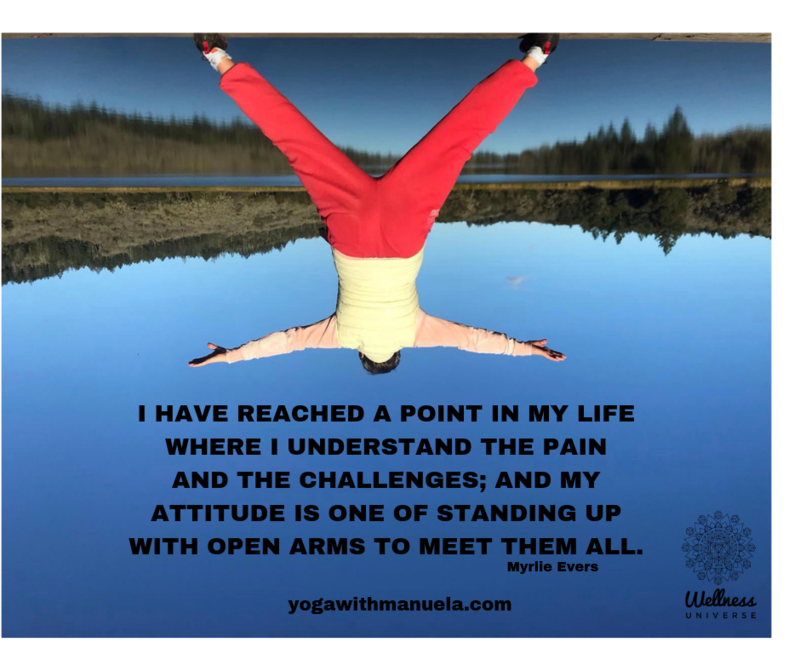 Manuela Rohr is a writer and Yoga teacher/therapist BDY/EYU, C-IAYT. With roots in Germany she now lives with her husband and daughter in Santa Rosa, CA. She is the mother of a micro preemie girl and shares her healing journey in her blogs and teachings. She shares her transformational Yoga and Mindfulness lessons in workshops and private sessions. 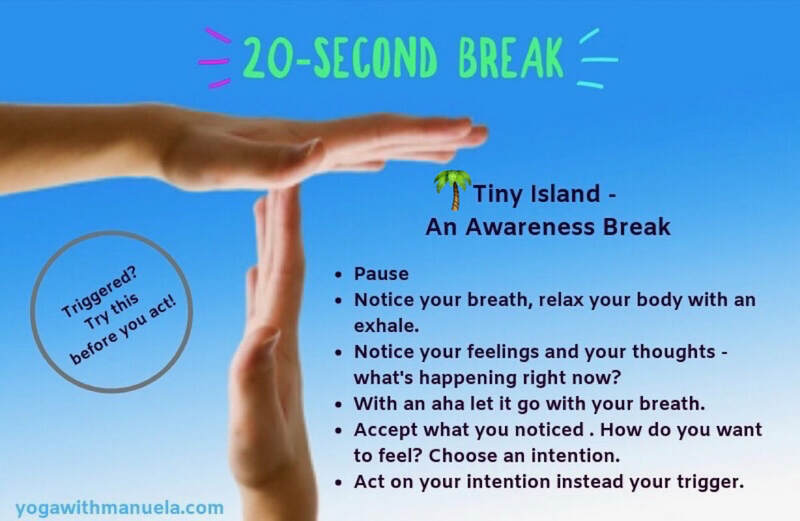 ​The 20-second break is an awareness break. It's simply stopping what you are doing or thinking or saying or being for 20 seconds and using that 20 seconds to notice what is happening to you and around you. ​It's similar to the advice: breath before speaking when you are upset or angry. But it takes it a bit further. It's one cool tool to help me cope with triggers causing stress in my life. I have a master-trigger-creator walking next to me almost 24/7. My daughter Sarina in her specialness, I’m telling you, is here for the sole purpose to teach me what I need to learn. These 20-sec breaks are my golden tool to not fall prey to feeling trapped and helpless when challenged. Living with a high function spectrum person is walking on thin ice. Triggers can fly around me like bugs under the street light on a summer night. With my awareness muscle strong I can manage to not to bite the hook, flip the switch and let freedom reside in my chest instead of burning up about half the time. The other half is the learning I need to do, well we all need to do until the end of time. Right? For me making tiny steps on my path and using my tools counts! Give it a try! It offers a maximum gain in self-awareness. It’s easy yet powerful. Let me know in the comments if it works, I always love to hear from you! ​I believe in the power of a pause. I created my Tiny Islands because of that. To pause means taking care of ourselves. I'm talking about a meaningful pause. 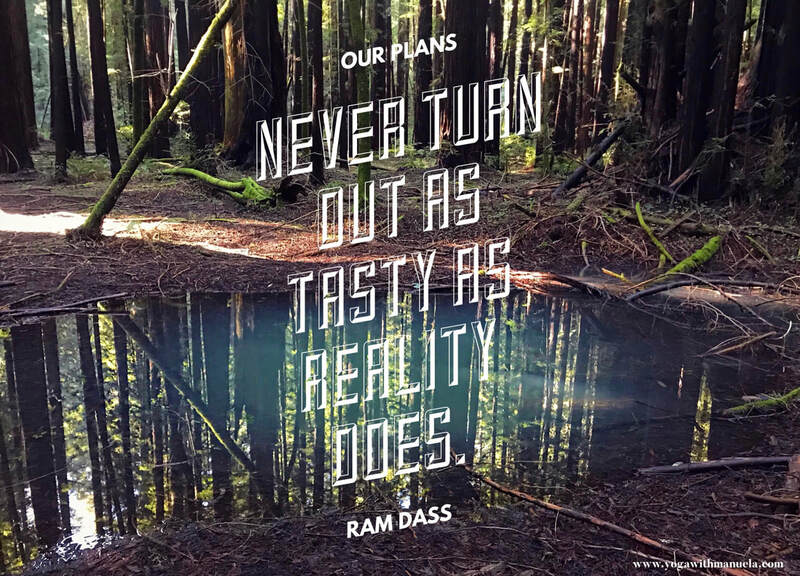 One that has the wisdom of yoga and mindfulness at it's core. One I choose not because I'm exhausted or grumpy or unmotivated but because it nourishes me. And because I care about how I feel. What I do on my Tiny Island fills me up with gold. It delivers the strength to sit on my horse and ride it, no matter how slowly. The energy I gain there doesn't allow for victim mode, or the lousy feeling of giving my power to the horse dragging me along. I know what I'm talking about. As a special needs parent I'm constantly giving and needed. Twenty-eight years is a life time of care taking. And the journey continues! I have understood destiny delivers what it delivers and we're responsible for our lives. I know how being energized feels. I'm not willing to live without it. This is one precious life we have! That's enough reason to practice!!! Right? Being exhausted is the pest of our time to almost everyone I talk to. Please hop on a Tiny Island and change that. Just a moment of time before you go to bed and in the morning before the to-dos catch up is the perfect time to start filling yourself up. Please don't underestimate the little things. It's all connected to a life were soul full self-care is celebrated. And don't forget self-care is the sister to self-love! Pause now before you click off - read the poster again and follow it - it only takes a minute! I don't shine if you don't shine! I'm in the process of writing two books. One is about my healing journey with my daughter Sarina. The other about my 365 Tiny Island . They saved my life. My daughter was born a micro preemie in August of 1990. Her weight? One pound and fifteen ounces. I became a special mom to an extraordinary child. I thrive despite the challenges because I have created Tiny Islands for myself. I know how it feels to have NO TIME. I know how it feels to give 24/7. I know how it feels to be exhausted. GIVING and RECEIVING must be balanced. I'm addicted to joy  in my life. And JOY says: "please fill you cup." But, you must be serious about Self-Love. Don't break from the challenge. It’s for everyone. Sign up there for my newsletter. You will receive Tiny Islands and weekly inspirations. Wednesday Whispers 10/19 - what role do you choose? ​I don't know about you, but chances are you agree with me: I have been in all of those roles, sometimes all in one day ☺️. In my life I want to be able to see what role I take on - it's my choice. It might be triggered by circumstances, never the less I can self reflect and if I feel I was in the dark, recognize it, forgive myself and move to the light. Take a breath with me now - gift yourself a smile - and choose what role will serve you well today.  Walking tall, crown on! Ps: If you have been thinking about practicing with me, hanging out with me in Sedona... the doors are closing. At first, I embraced these words with a full Yes! But a moment later I caught myself in a reflection of some of my plans which didn't turn out as I had hoped. Where I wanted something else as what I got. Was reality tasty? No, it wasn't - but it put me on a path where I was able to learn something valuable. A yogic lesson that's asking us to bring awareness to our expectations like when we want what others have and forget to appreciate what is already ours. To practice non - attachment is a life long practice, with fierce awareness at its core. It's of course not wrong to make plans but what expectation we attach to them can break us when not delivered. Stay open, stay in the flow and embrace what you have. It might taste different never the less it's rich in flavor. Don't forget to honor the present moment, because you focus too much on what the future should bring. Embrace what you have! Breathe and take your next step! PS: picture by my German friend Louisa - Armstrong Redwood Park, CA! It's a retreat for your soul, grab a spot now! Wednesday Whisper 8/19 - Pay Attention! 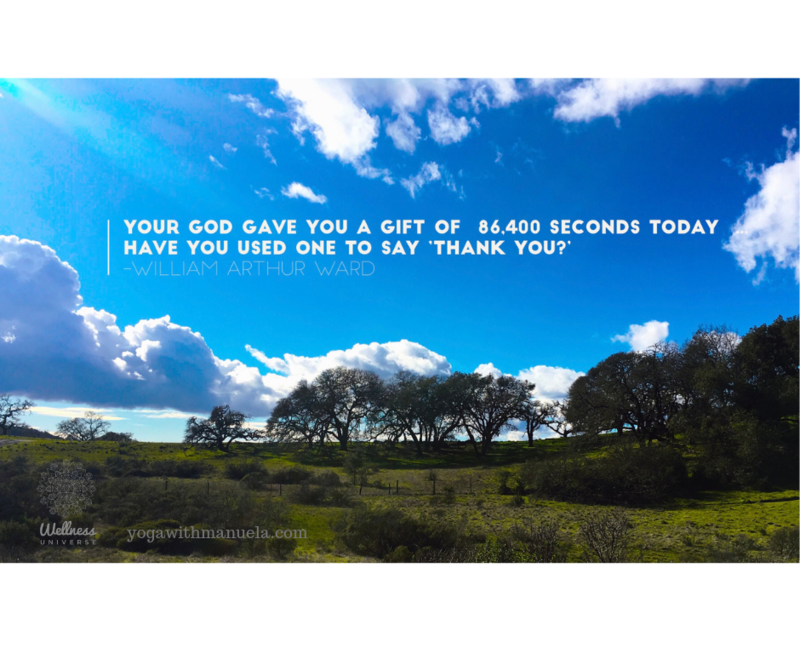 ​I took this picture on Sunday, 2-17-19 on my hike in Annadel Park, Santa Rosa - It let me have more then a second of magic because I stopped to pay attention and say Thank you! Sometimes all we have to do is look up! Whatever you hold in your attention has a unique power to change your brain - and I know this to be true - it will change your life! Even if only one second at a time! Let it fill you up. It's all you've got! I don't shine if you don't shine! Want to practice with me? Or meet me in person? *Yoga is, of course, my # One! It delivers joy and is the antidote to the pain of all kinds. It's a transformational practice of body, mind, soul, and spirit. It's not tight to flexibility or shape or size or anything else for that matter. The only thing you need to ask yourself is: "Are you willing to be 100% present to who you are and what is happening in your life?" My today's whisper embraces this learning. "No matter what", I keep saying to myself, "my arms stay open!" **Stay tuned! I'm working on bringing Yoga to your living room. On Line! PS: The picture was taken by my friend Louisa at Lake Ilsanjo, Annadel Park Santa Rosa. I'm telling you, sometimes I'm close to paradise! Are you a special needs mom? Join her free FB group here! 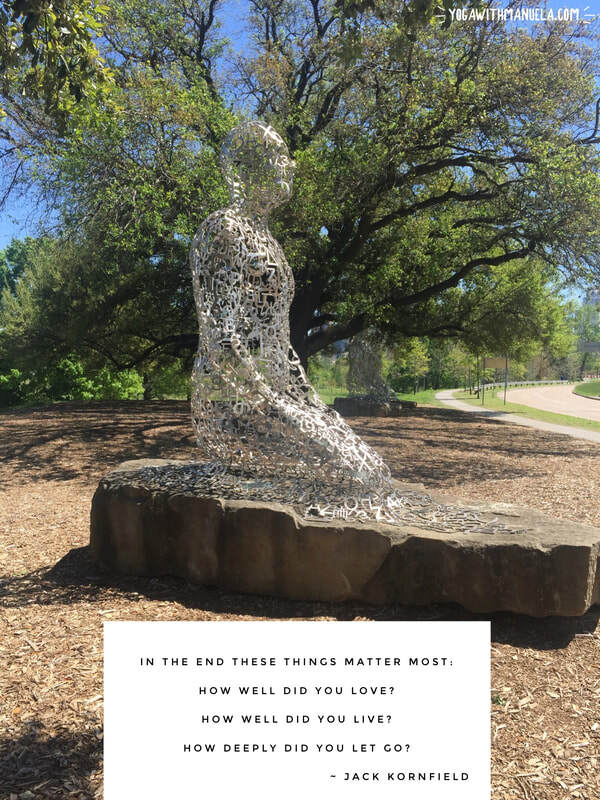 wednesday whisper 6/19 - What matters in the end? These words hold a truth we all can agree upon. For the following week, I chose to take them to heart. What it takes is the willingness to practice self-reflection and self-care. 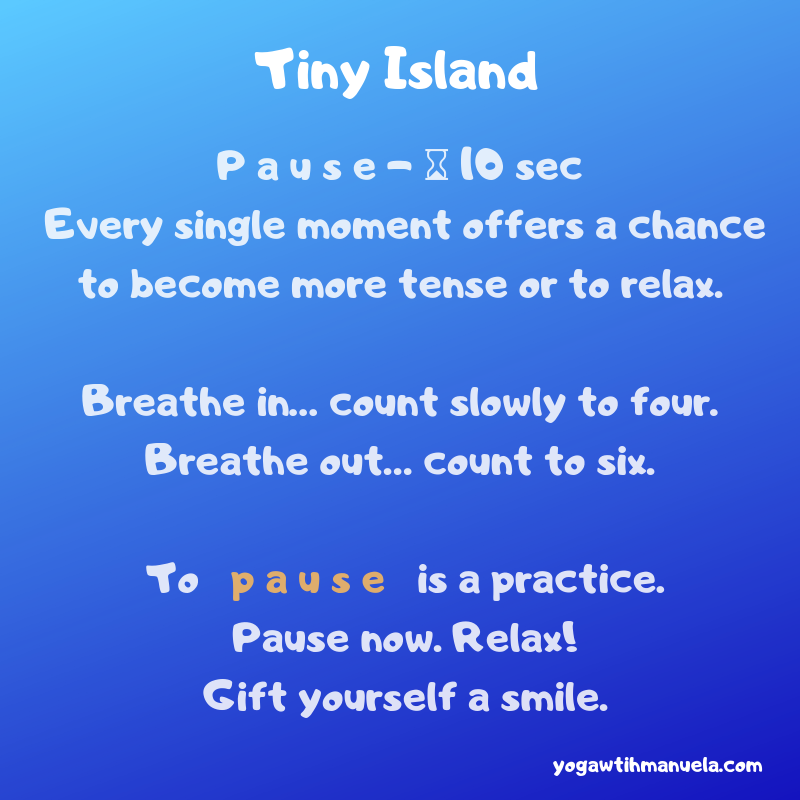 TINY ISLANDS are the times in my day I pause to practice self-reflection and self-care. 1. How well did I love? Breathe and ask: Did you include yourself? Go love up on yourself if you forgot. 2. How well did you live? Breathe and ask: Did you have joy in your day? if not - go out look up at the sky and be in awe. 3. How deeply did I let go? Breathe and ask: Where did I get stuck in forgiving myself or others? Go and let it go. What we practice takes root. Join me! If your compassion does not include yourself it is incomplete. "Forgiveness is giving up all hope of a better past." I have this quote on my wall, and it caught my eyes today. I find it to be the most important practice to do if we want not to be hunted by past events or fall prey to stirring old stuff up when we are triggered. The thought often makes me move back in time to past events. But yesterday or even the moment before I sat down to write this belongs to the past too I thought. As I sat down as I do every day to do my Self Presence Exercise* before I start a project (I need to share with you - I promise I will!) the most immediate past kept popping up, and I used Jack Kornfields words to forgive myself. *Self Presence Exercise is part of my collection of 365 Tiny Islands, each island offering a moment to pause and refresh. Stay tuned, it's in the works. Without compassion for ourselves, how can we have compassion for others, right? 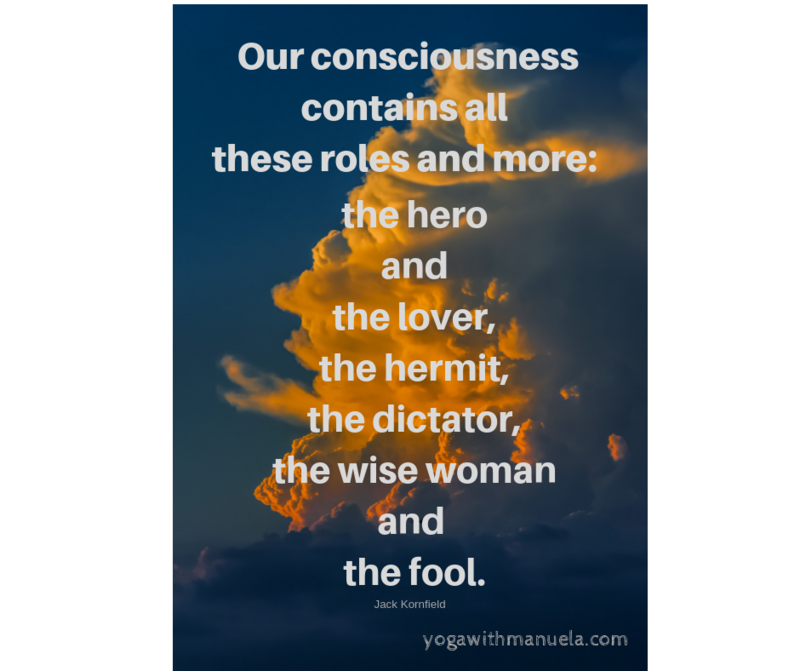 Manuela Rohr is a writer and Yoga teacher/therapist BDY/EYU, C-IAYT. With roots in Germany she now lives with her husband and daughter in Santa Rosa, CA. She is the mother of a micro preemie girl and shares her healing journey in her blogs and teachings. She shares her transformational Yoga and Mindfulness lessons in workshops for special needs moms like her and private sessions.